After being grounded twice last week for overcast, fog and low cloud ceilings, a strong high pressure finally came into the Cook Inlet area and brought sunshine and blue skies. Prime weather for my first cross country flight. I had worked out two possible plans, one to Kenai and one to Talkeetna. Since I’ve been to Talkeetna before, I chose Kenai as our destination. 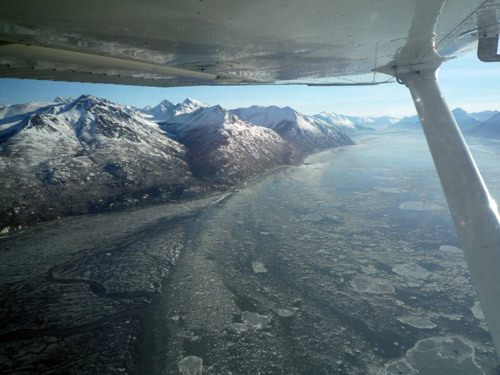 I called the Kenai Flight Service Station to get an updated weather briefing, and then with my map and nav log charts clipped to my new kneeboard, we took off from Merrill and turned south. As we flew over Campbell Airstrip, I activated my flight plan over the radio and then began my process for identifying and logging my checkpoints along my course. Adding the new element on navigation into the mix, I suddenly understood the extreme importance of efficient cockpit task management. Put simply, there isn’t alot of time to fiddle around and just look outside at the scenery for long periods of time. In addition to all the navigation stuff, which include looking for checkpoints, writing down your times, dialing in the VOR frequencies and radials, you have to keep flying the plane, look for traffic and work the COM radios. It’s alot to keep track of. My biggest trouble was holding a steady altitude. There were a number of times when I’d look at my altimeter and notice that I had gained or lost a few hundred feet during the last time I looked. I tried to adjust the trim wheel accordingly, but I didn’t seem to have the touch today and kept having to make big adjustments. This shows me that I need to get into the habit of glancing more frequently at my altimeter, or even better, just work into a system of regular glances of all my instruments. It also teaches me that I need to base more attention regarding my up and down heading on the attitude indicator, instead of the vertical speed indicator, which shows trend and thus has quite a bit of lag. The attitude indicator is what will show me immediately if I’m pointed up or down. I also learned that if you were not somewhat familiar with the territory, it can be quite easy to get lost, or at the very least, misidentify a checkpoint. Frozen lakes start to look alike, as to rivers, and along the way, I made a couple of navigation mistakes, one when I was looking for a checkpoint in the distance that we had just passed over and another when I mixed up the direction to a VOR radial. Small mistakes that made me glad that I had an instructor in the plane for this first cross country. I did well correcting my mistakes, though, and also had to correct for the wind a couple of times. All in all, though, my course and estimated times between checkpoints ended up being very close to what I had planned. My landing at Kenai was very good, one of my best. It was exciting to fly the downwind leg, turn base just before the water and then turn to final and land on an unfamiliar runway. The runway at Kenai is deceiving, because from the air, it looks quite small, but that’s just because the taxiways are really wide. The runway itself is very long and wide enough to accommodate much larger aircraft. We didn’t stick around, I’ll save that for one of my solo cross countries. Instead, we just taxied back to the runway and got ready to head back to Merrill. I practiced a soft field technique on the takeoff; it was my first time, and so I didn’t hold the plane as level as I could have while gaining speed just above the runway when we left the ground. That will take more practice. Approaching the Chickaloon Bay on the way back to Anchorage. At one point as we were flying back to Anchorage, I did a wind speed calculation on manual flight computer, using the DME for groundspeed reference. It seemed that we were fighting it quite a bit and my calculation indicated almost an 18kt headwind at that altitude. It was definitely slowing us down. Coming in over Potter’s Marsh I called up Merrill Tower and announced myself on a Campbell arrival- yet another new thing. After passing the airstrip, I began my descent and we came in straight on the base leg to the runway and turned final. For the landing, I wanted to practice a short field technique. I came in very slow, just under 60kt, and seemed to be all set to touch down at the end of the runway, but I think that I didn’t pay enough attention to the VASI and I ended up coming in too low. I realized that if I didn’t correct, I wasn’t going to make the end of the runway, so I added some power. In my slight panic, I added a bit too much power and ballooned up before coming down somewhat hard. The funny thing was, Mark just sat there, calm as could be. Later he told me, “I wanted to see what you would do and how you would correct it.” In his eyes, it was a pretty good short field landing, as I put the plane down right on the numbers, I just needed to refine how much power to give it in that kind of a situation. As with the soft fields, I just to go out and get some more practice, perhaps at Birchwood. Overall, it was a very educational and rewarding lesson. Essentially, it was the real deal- going from one place to another by airplane, and it felt really cool. I look forward to my night cross country on Wednesday, and then my solo cross countries after that. I am now over halfway to my required 40 hours, although with longer flights now, the rest of the hours will come relatively quickly. 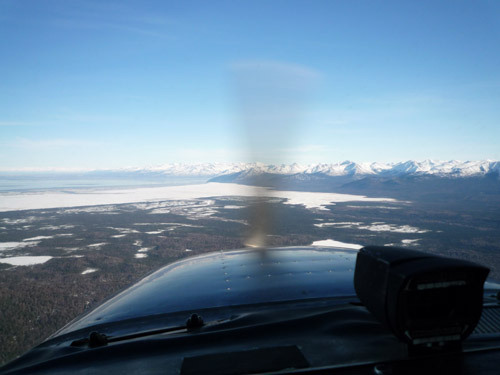 This entry was posted in Flight Lessons and tagged cross country, Kenai, Merrill Field, N52654 Cessna 172. Bookmark the permalink.